There are many oral habits that are beneficial to the overall strength and health of the teeth and gums, but there are just as many habits that can be harmful. 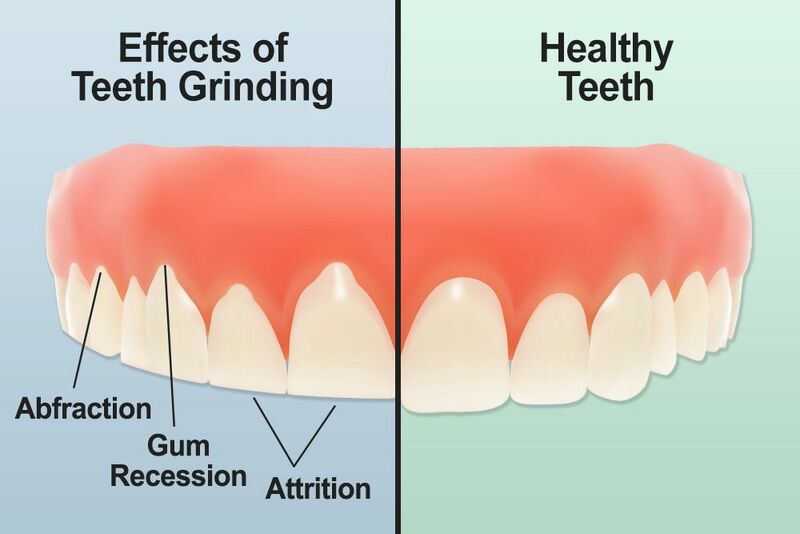 One of the most potentially damaging oral habits is teeth grinding. Unfortunately, many people engage in this habit are completely unaware that they do so. This is often a subconscious action that takes place primarily while a patient sleeps. General dentistry services, such as routine exams and cleanings, help the dentist at Plymouth General Dentistry monitor a patient’s oral health and identify the signs of teeth grinding. Once this habit is detected, we offer treatments and techniques to stop this habit so that the dangers of teeth grinding can be avoided by our Plymouth, NH patients. Abfraction: Abfraction is the loss of healthy tooth tissue along the base of the tooth, near the gum line. This loss of tissue is different from tooth decay, in that it is not caused by a buildup of bacteria. Instead, the continual exposure to forces and pressure (such as that caused by teeth grinding) results in the loss of otherwise healthy tooth tissue. Attrition: Attrition is a general wearing down and weakening of the teeth. Again, this is not a result of bacteria, plaque, or tartar, but rather an overall loss of healthy tooth tissue as the result of prolonged exposure to excessive forces. Chips, cracks, and fractures: Because teeth grinding weakens the teeth over time, it also increases the risk of a sudden injury, such as a chip, crack, or fracture, all of which expose the inner layer of the tooth and increase the risk of decay and infection. Gum recession: Teeth grinding does not just place pressure on the teeth, but on the gums as well. This force can cause the gums to pull away from the teeth, a condition described as gum recession. Gum recession has its own dangers, which include gum disease and tooth loss. TMJ disorder: The jawbone can also be affected by teeth grinding. Many patients who habitually grind their teeth end up suffering from TMJ disorder, a condition that limits the movements of the jaw and can cause uncomfortable symptoms such as headaches, lockjaw, and neck/shoulder pain. Once teeth grinding is diagnosed, it is important to take steps to help prevent this harmful habit, as well as to undergo restorative dentistry treatment to repair any oral damage that may have already occurred. One of the best treatments for teeth grinding is a custom mouth guard that can be worn while the patient sleeps in order to prevent the teeth from rubbing against one another. Some patients may also require orthodontic treatment, as a misaligned bite is a common cause of teeth grinding. Our experienced dentist can discuss all of these treatment options with patients in further detail and help them find a treatment plan that best meets their unique needs. Teeth grinding may not seem like a harmful habit, but it can greatly compromise the strength and health of your teeth and gums. To learn more about how you can avoid the dangers of teeth grinding, schedule an appointment with our experienced dentist at Plymouth General Dentistry.